The red pins in the bottom picture point out the nerves in the top pictures. 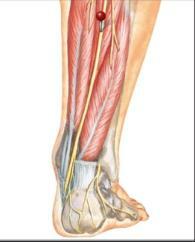 As you can see different nerves travel to different parts of the foot, top, bottom, sides and toes. 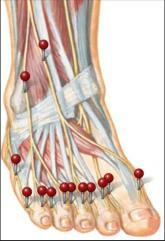 By isolating the exact location of neuropathy we can isolate the nerve involved. 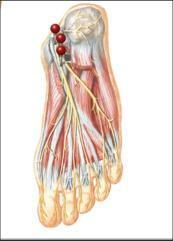 Peripheral neuropathy often causes numbness and pain in your hands and feet. 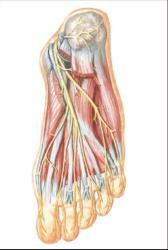 People typically describe the pain of peripheral neuropathy as tingling or burning, while they may compare the loss of sensation to the feeling of wearing a thin stocking glove. Peripheral neuropathy is caused by nerve damage. It can result from such problems as traumatic injuries, infections, metabolic problems and exposure to toxins. One of the most common causes is diabetes. In many cases, peripheral neuropathy symptoms improve with time, especially if it's caused by an underlying condition that can be treated. 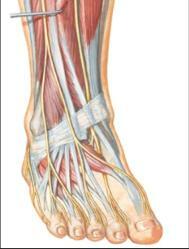 A number of medications are often used to reduce the painful symptoms of peripheral neuropathy.